Dana Chapman is a rising name in the hard game of Hollywood. She's starred in many commercials for brands such as McDonalds, Marriott Hotels and Ford just to name a few. Her latest endeavour, starring in Old Dominion's music video for 'Break Up With Him', is proving very popular and the song is climbing up the Country Billboard charts, as well as amassing over 19 million views on YouTube thus far. Chapman took some time out of her busy schedule to do a quick Q+A with me. Q: How was it acting in a music video as opposed to TV shows or commercials? A: Both are a ton of fun! Videos tend to allow for a little more creative freedom while shooting. Commercials don't usually have the flexibility to stray from the script or story boards. Music videos tend to be longer days. There's often a lot more going on as far as scene, location & wardrobe changes. Videos are essentially 2 minute short films, whereas commercials are told in 30 second segments. Q: How did you break out in Hollywood, especially as the industry is so saturated and everyone wants to be famous? A: A lot of hard work, and perseverance. The industry is constantly evolving and you have to be willing to roll with it. Amidst the rejection, you have to go forth with the mindset of "never taking no for an answer" - maintaining professional relationships are dire. The majority of my job are from referrals or direct bookings from people I've worked with before. You also have to get money and fame out of your head from the start and know it's only a small percentage of people who fall into that spectrum. Above all, having a team who works hard for you and believes in you is most important. My agents at Commercial Talent and my publicist, Marilynne Mungovan at Revele Inc are the driving force behind it all! Q: Was it fun on the set of 'Break Up With Him'? Any stories you can tell us? A: We had a blast on set! We shot from 8am until 1am in downtown Nashville. At midnight, we started shooting the scene with the DeLorean - the director Steve Condon had the DeLorean driven in from South Carolina just for the occasion. It was an exact replica and the passenger side visor was designed by Michael J. Fox. Q: How were the members of Old Dominion to work with? A: The guys of Old Dominion are the best! We shared so many laughs throughout the day and have hung out a few times since. I'm so happy for all they've accomplished - they deserve all the success in the world! Q: What are your top 5 music tracks? A: 1. All the songs on the Hamilton soundtrack! Q: Is there anything you're working on next? A: I'm currently shooting the web series Quality Time and I'm in the process of writing and producing my own content for the web. Q: Would you like to do more music video work or just stick to TV? A: I'm happy doing anything that has an interesting concept or storyline. I love performing and collaborating with other creatives, no matter the outlet. Thanks to Dana Chapman for taking the time to answer my questions. Follow Dana's updates on Twitter and Instagram. 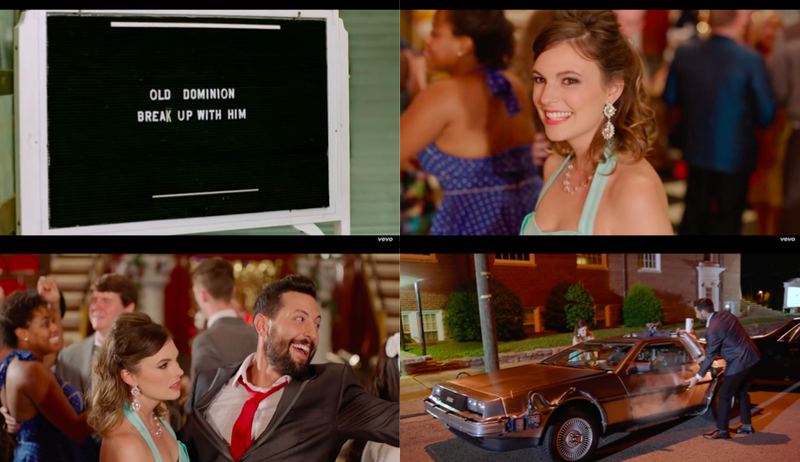 Watch the video for Old Dominion's track 'Break Up With Him', embedded below. Don't forget to follow me on Twitter and Facebook, so you never miss another post.